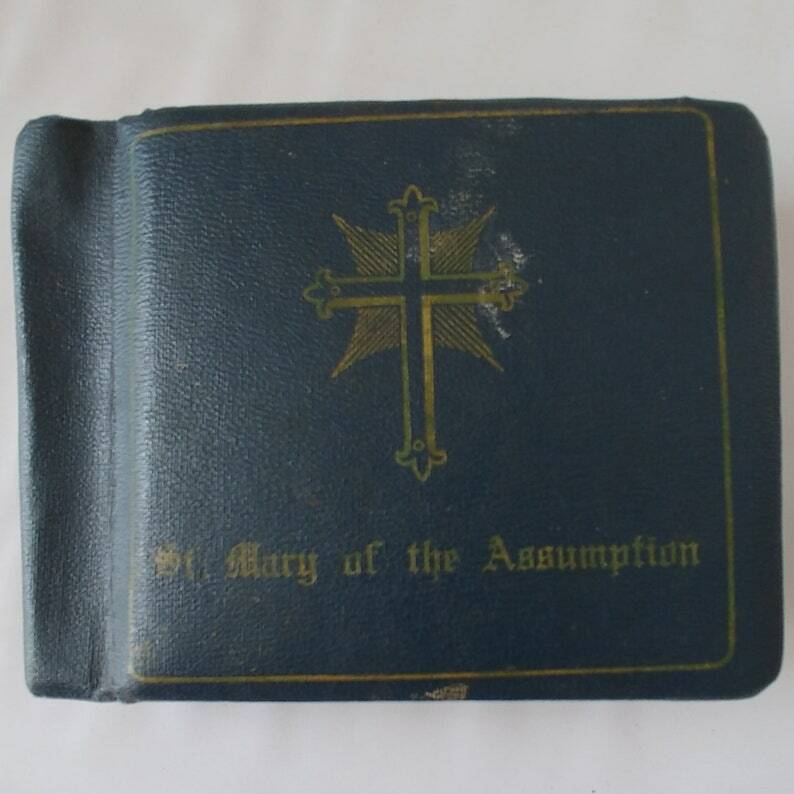 The cover of this 1959 autograph book has the logo of St. Mary of the Assumption embossed in gold. Inside the zippered cover, there are pre-printed with the school pledge along with spaces for listing teachers, classmates and favorites. There is also a black and white photograph of the school, a pasted in photo of the student (David Schutte) along with 128 multiple colors of pages for autographs. The back of the book has 8 black pages for photos (photos have been removed) with the first page imprinted in gold with "Photographs to be Remembered." Of the 64 page leaves in white, pink, yellow and blue, 23 leaves have handwritten messages in blue ink. The ivory inside covers have stars embossed on them. Zipped shut, the autograph book is 6.25” wide x 4.25” tall x 1.25” thick. It is in excellent condition with very little wear and stains on the outside cover and minor marks on the inside covers. All pages are firmly attached to the spine and the brass zipper functions smoothly.